Minnesota has a unique opportunity to expand charitable giving by proactively addressing the generational transfer of wealth that is affecting communities throughout the state. The Endow Minnesota tax credit is designed to place wealth created in Minnesota into community "savings accounts" as permanent endowments held by community foundations. The 25% tax credit will encourage donors to consider endowment building as a way to create permanent assets to put to work to create their community's future. Approximately $47.9 billion in wealth will be transferred from one generation of Minnesotans to the next in the coming 20 years. Keeping these assets in Minnesota communities will be a big challenge . . . and an opportunity. Minnesotans have worked hard, invested in their land and saved money. Many have lived their entire lives in the communities where they were born. But demographics are shifting and so is community wealth. Endow Minnesota creates the opportunity to hold onto some of those assets to help communities grow, change and be the places where future generations want to live, work and thrive. Community foundations match donors with giving opportunities that make a permanent difference in local communities. Donors create endowed fund to support community foundation and other charitable activities. They create donor advised funds. They create funds on behalf of nonprofits that may not have the capacity to manage an endowment. The options are many. Community foundations exist to promote philanthropy, support donor choice and grow thriving nonprofit communities. Endowments are permanent. Contributions to endowments are preserved as principal. Investment interest provides an ongoing revenue stream for grants to nonprofits, other community investments or sustaining support for nonprofits. Endowments held by Minnesota’s community foundations respond to today’s needs while also providing resources for communities to change and adapt for the future. Endow Minnesota has the potential of making $120 million in new grants available each year to support local community and economic development projects. Those who contribute to the permanent endowments held by local community foundations would be able to choose a tax credit of 25% for gifts of between $5,000 and $100,000 annually [ranging from a minimum credit of $1,250 to a maximum of $25,000] rather than a standard charitable giving tax deduction in their state income taxes. Up to $4 million in tax credits would be awarded each year. To take advantage of the unique opportunity created by the unprecedented transfer of wealth in Minnesota, the tax credits would be available for only 14 years. The Endow Iowa tax credit, in place since 2004, has grown annual giving to permanent endowments in community foundations by more than 200 percent. In recent years, Maryland, North Dakota and Montana established similar tax credits. Efforts are underway to enact “endow” tax credits in Wisconsin, Ohio, Indiana and Kansas. It is becoming a national conversation. Look at the Endow Minnesota bills and their authors in the Minnesota House and Senate. 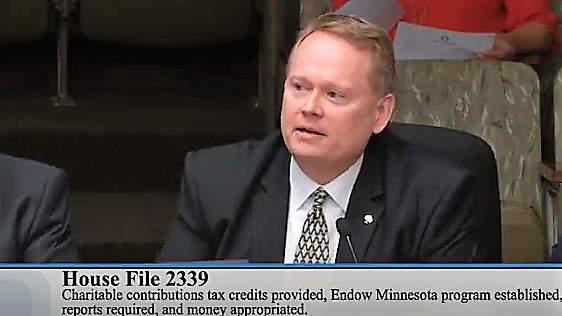 Learn more about the value of Endow Minnesota by listening to the 2018 hearing about the idea held in the House Taxes Committee. Passage of the Endow MN bill is primarily dependent on legislators hearing from community foundation staff, board members and donors. It is important to contact the legislators who represent you, as well as members of the House and Senate Taxes Committees. Contacting Governor Dayton can also be helpful. Download a PDF of the Endow Minnesota talking points below. If you are interested in getting involved with this initiative, please contact Bob Tracy or Katina Mortensen. MCF is enthusiastic to support members in conversations with their state legislators about community foundations and the long-term community benefits of this proposed tax creditt.